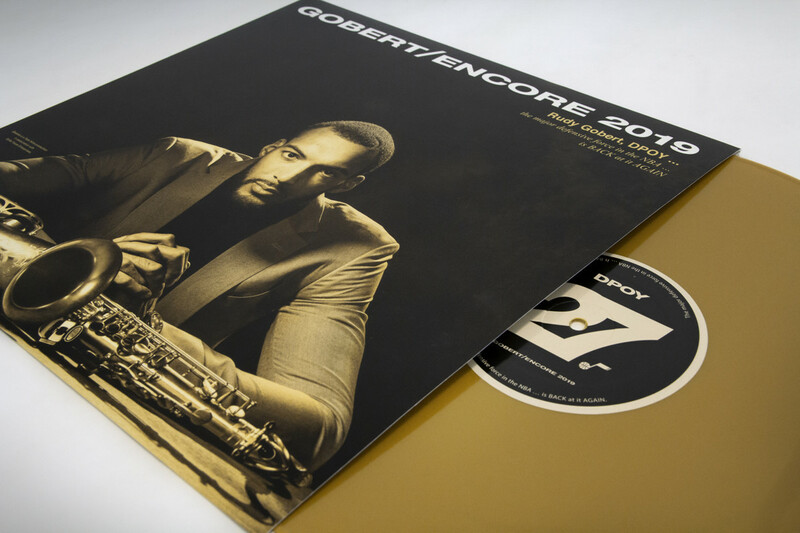 The Utah Jazz are kicking off Rudy Gobert’s 2019 Defensive Player of the Year campaign with the release of Gobert/Encore 2019. The decorative album is a fitting tribute to a modern star with throwback sensibilities, as Gobert tries to defend his title as the NBA’s defensive king. The Jazz creative team paid tribute to the Utah Jazz name through the recreation of a classic jazz album: John Coltrane’s “Prestige 7105.” The albums were pressed at United Record Pressing in Nashville, Tenn., the same company that pressed Bob Dylan's “Highway 61 Revisited,” Jay-Z's "The Black Album” and Miles Davis' "Kind of Blue.” The jackets were printed at Dorado Music Packaging in Los Angeles. The Jazz organization on Friday morning began a campaign for the Frenchman to be voted the NBA’s Defensive Player of the Year by releasing a vinyl record-themed package reminiscent of an album by famed jazz musician John Coltrane. While there’s no actual music on the record, the package highlighting Gobert’s defensive prowess has just about everything else a real record and jacket would. The front cover features a portrait shot of the big fella, while the inside booklet that would usually have song lyrics contains some of his impressive stats and “reviews,” things people around the NBA have said about him.
" ... it makes me want to work even harder for this organization. " The whole thing is incredibly detailed, down to the fact that it even smells like an old record. Gobert said he’ll likely keep it in his trophy room, while he suspects his mother Corinne will hang it up in a more prominent place, even if he doesn’t fancy that idea much. “I’ll tell her not to, but it is what it is,” he said. Although Gobert said he might not boastfully display the package, he is thankful the Jazz organization would go to such great lengths to make award voters aware of what he’s done this season. As far as the actual award is concerned, Gobert said winning it for the second year in a row would be a big deal to him. After busting out some jazz music on Thursday, does Gobert think he’ll listen to it regularly moving forward?